except under permit issued by the California Department of Fish and Wildlife. 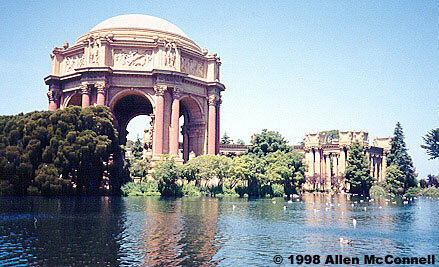 According to news reports, the resident snapping turtles in this San Francisco pond occasionally bite off the legs of birds floating on the water. 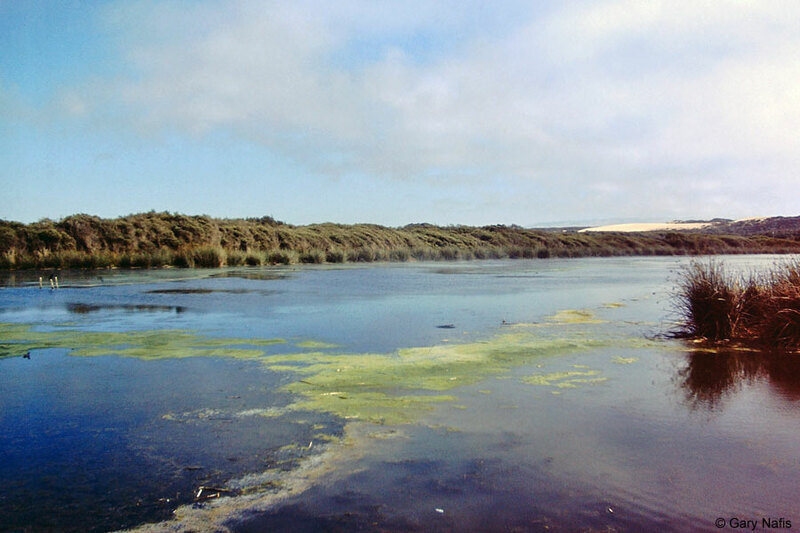 Snapping turtles have shown up in various locations in California, including the lake in San Luis Obispo County shown on the left, and the lake in Santa Barbara County shown on the right. It is not known if all of these populations are established and breeding. A large freshwater turtle with a massive head with huge hooked jaws, a long tail, a saw-toothed crest, and a shell that looks like it is too small to fit the body. The legs are large with webbed toes and heavy claws. The tail is longer than half the length of the carapace. Average weight is around 45 lbs, but some captives have weighed in at over 75 lbs. The skin is gray, black, yellow, or tan, with tubercles on the neck. White flecks occur on some individuals. The color of the carapace ranges from black, brown, or olive to tan. Often it is covered with mud or algae, which helps camouflage the turtle. It is heavily serrated on the rear, and scutes may have a pattern of radiating lines. The plastron is tan or yellow. Males typically grow larger than females. Young have 3 prominent serrated ridges on the carapace. These ridges become less conspicuous as the turtle ages. The tail of a juvenile is longer than the length of the shell. Aquatic, found in or near water. Considered most active at night in the southern part of its range, it is apparently more active during the day in the northern part of its range, which probably includes the Southern California locations, also. Sometimes seen basking on or under the surface in shallow water. Often rests buried in the mud with its eyes and nostrils exposed in water shallow enough that it can raise its long neck up to allow the nostrils to break the surface and breathe without moving out of the mud. Active most of the year, becoming dormant in areas with cold winters, generally in late October. Remains dormant either burrowed into the mud bottom, or under overhanging banks, root snags, stumps, brush, logs, or other debris. Large groups have been found hibernating together, sometimes with other turtle species. Emerges some time between March to May, depending on the climate. Longevity has been estimated at up to 40 years. 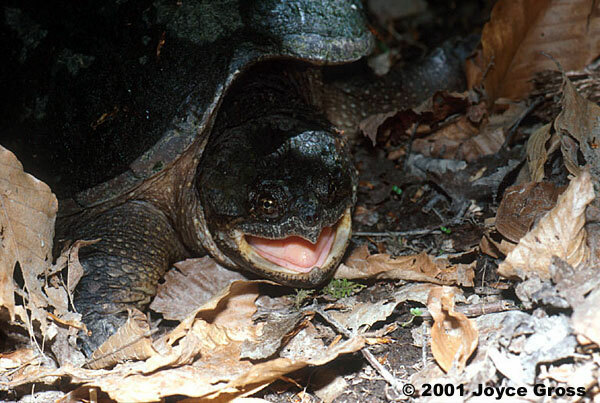 Snapping turtles are ill-tempered and capable of producing a very serious bite. Omnivorous, eating anything that fits into its jaws, including snails, earthworms, shrimp, crayfish, insects, fish, frogs, salamanders, reptiles, small turtles, snakes, birds, mammals, plants, and carrion. Young turtles tend to forage actively, while adults tend to lie in ambush. Adults become sexually mature in four to five years. Females crawl onto land, sometimes travelling over great distances, to dig a nest where they lay a clutch of eggs, generally from 20 - 40, (ranging from 6 - 104). Egg laying takes place mostly in June and July (but can occur any time between May and October). The eggs hatch in 9 - 18 weeks. During cold winters, hatchlings will overwinter in the nest. Females may retain viable sperm for several years, so they do not necessarily need to breed with a male each year to produce viable eggs. Found in just about every type of freshwater habitat in its natural range, including marshes, ponds, lakes, rivers, and slow streams. 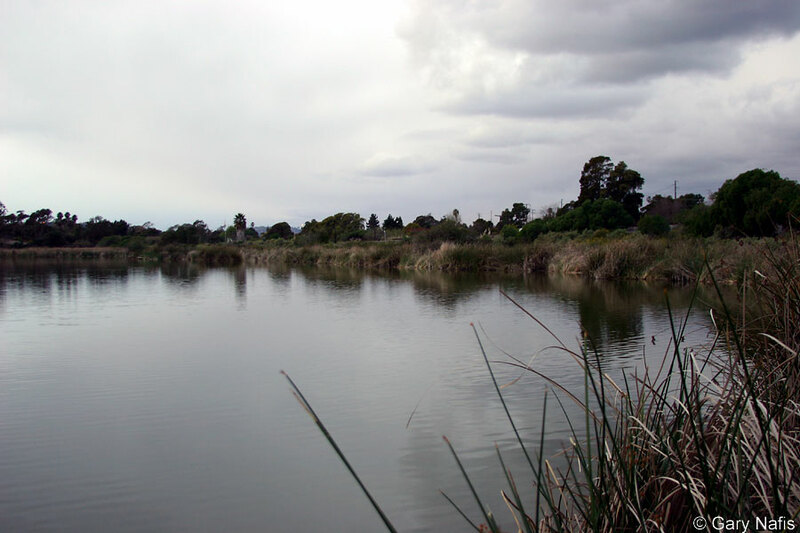 Prefers slow-moving shallow waters with a muddy or sandy bottom and abundant aquatic vegetation or submerged roots and trees. Also occurs at the edges of deep lakes and rivers and in brackish coastal waters. 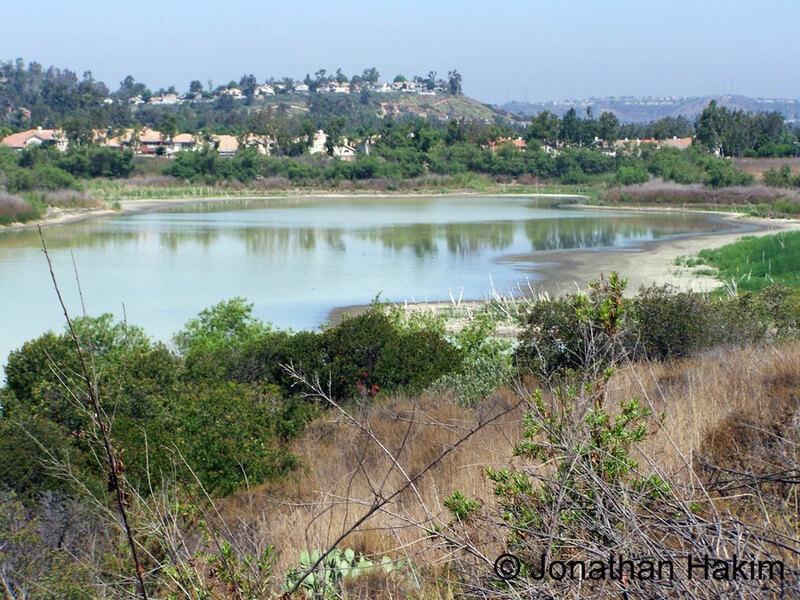 Since many snapping turtles seen in California are released or escaped pets, it is not possible to know if they represent established breeding populations. There are probably many more locations where this turtle has been seen in the state than I list below. - Fresno County near Fresno. 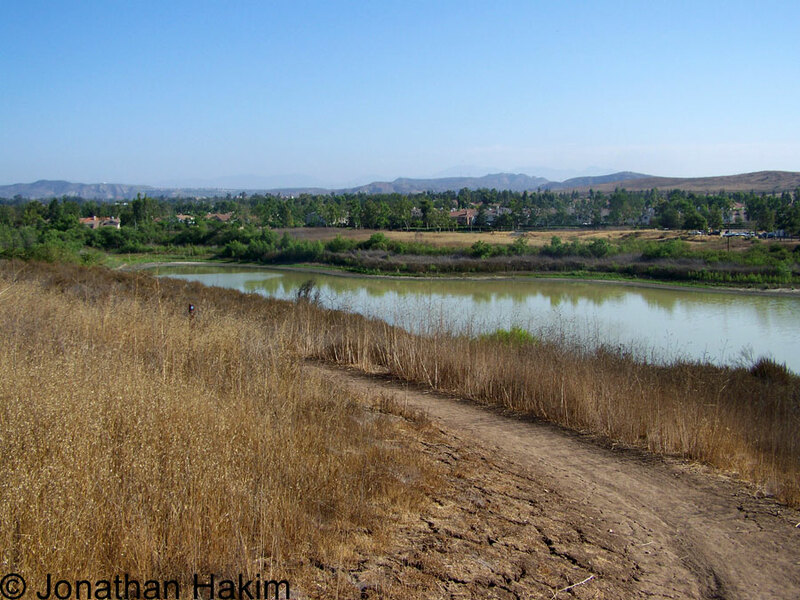 - San Diego River in Mission Valley. 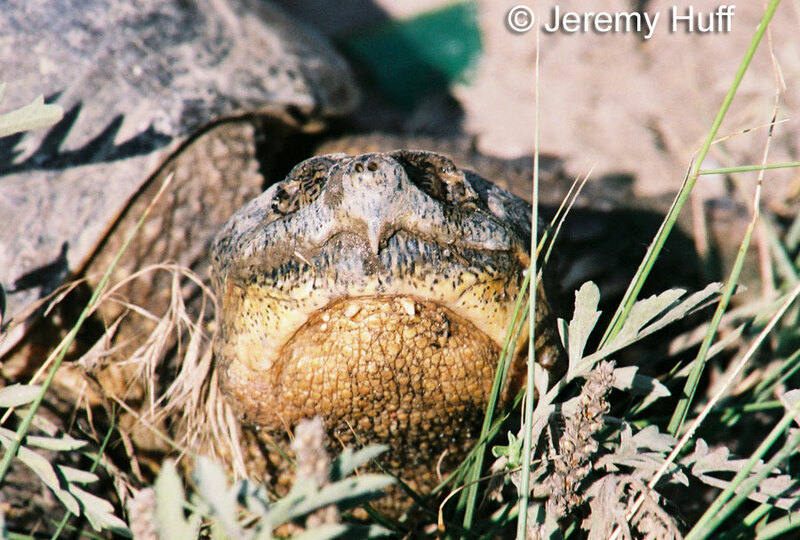 Other reports confirm that there is a breeding population of snapping turtles in the river. The native range of the species Chelydra serpentina - Common Snapping Turtle is roughly from the east coast of North America to the Rocky Mountains and from southern Canada to the Gulf Coast, and along the east coast of Mexico from Veracruz through Central America to Ecuador. The species has been introduced into a few areas west of the Rockies where it may or may not be established, including Oregon, Washington, Utah, Nevada, Arizona, and California. C. s. osceola - Florida Snapping Turtle. "Shaffer et al. (2008; Biology of the Snapping Turtle, John Hopkins Univ. Press.) provided convincing genetic evidence that C. serpentina is a "single, virtually invariant lineage" and hence abandoned the recognition of the subspecies C. s. osceola Stejneger, 1918." This voracious predator may pose a threat to the survival of native animals. It has been introduced into various locations probably due to negligent pet owners. It is not known if turtles in these locations are reproducing, but some nesting has been observed. 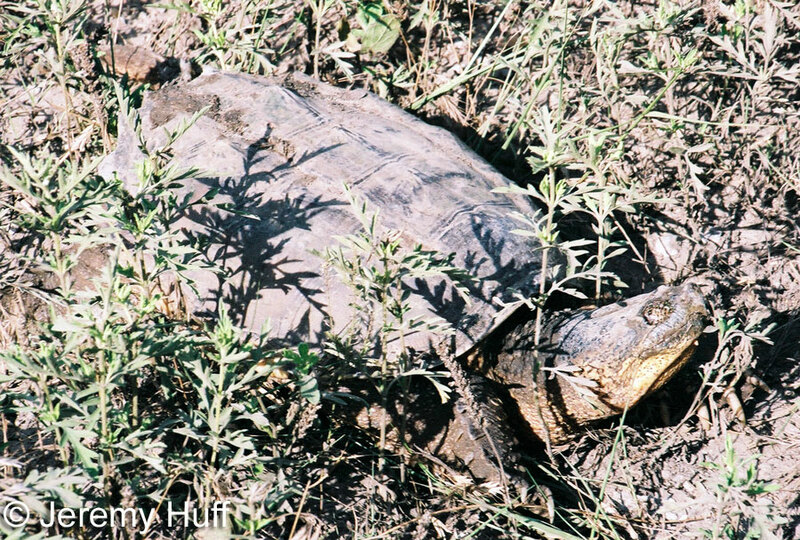 Snapping turtle meat is considered a delicacy, and is often used in turtle soup. Some populations have been severely decimated from overhunting. Chelydra - Greek - chelys- turtle, and hydros - water serpent - refers to the aquatic nature of the genus. serpentina - Latin - serpentina snake-like — refers to the snake-like neck.